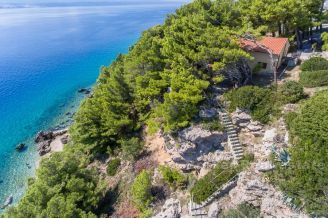 This superb sea front villa is located at area of Rogoznica, Razanj. It is positioned at super attractive part of Razanj, at end of dead end street, where all traffic noise is stopped. 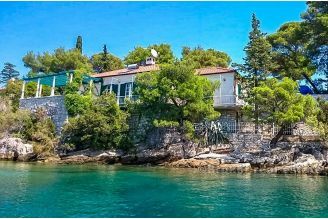 Also, in front of the property is beautiful small pebble beach in the small bay, which is in use only by owners and guests of this villa. Regrading villa, it consist of basement, ground floor, and first floor. There are existing internal stairs also for 2nd floor which is not finished, but there is valid building permit. Currently, this villa consist of 4 apartments, 2 on each floor, which could easily be converted into one unit, as family villa. On the basement is big tavern with inside fire place. There is several spacious terraces, oriented to the sea, with stunning sea views. From behind of the villa is an annex object, size of approximately 40m2, an studio apartment with kitchen. 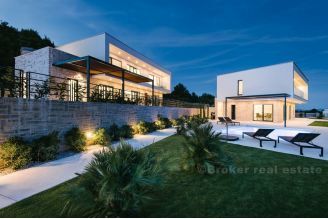 Distance to the town of Rogoznica is cca 5km away, while airport in Split is 30km away. 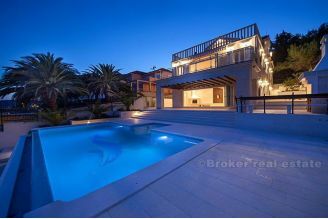 Superb luxury villa first row to the sea, at great location.